In response to a subscriber’s request, this month I want to share with you a way to use mandalas as a tool to better understand what’s going on with some aspect of our life…from a subconscious and creative perspective. when done, sit with it and interpret it as best you can…sometimes it happens right away, other times it may take a couple of days and some synchronistic happenings to find out what it means. It’s almost like interpreting a dream, which is another way our subconscious mind communicates with us. With time and practice you’ll start to recognize the language of your subconscious. Here’s one I did last week. I’ve been dealing with benign fibroid tumors for about 20 years now. In working with doctors and different therapies over the years, aside for having my uterus removed, we’ve done all that we physically can do with them. And over time menopause will help continue to reduce their size. That being said, knowing that our bodies often manifest unresolved emotional issues into physical ailments*, I decided to do a mandala to find out what if anything these fibroids had to say. When I sat down to do this mandala, I called in the energy of the fibroid tumors and the energy of my uterus with the intention of gathering insights from them. Surprisingly, this is the essence of what I saw in my mind’s eye. I had expected to see something dark and murky…which goes to show that it’s best to let go of any preconceived notions of what these mandalas will look like in advance. When I checked in with it I realized that the fibroid tumors were there to help me to lovingly accept the fact that I am a woman…a concept that has alluded me most of my adult life. I accept that I am a female and I accept that I was a girl growing up. However after that I’ve felt like I’ve been in this female limbo land. It’s been a real challenge for me to see myself as a woman. Essentially what they’re telling me, in a beautiful way, it’s time for me to grow up and accept my place/space in this world…that I am worthy of being and calling myself a woman. The image itself tells me that the energy of the fibroids has been quietly and patiently waiting in this beautiful location (park bench) for me to understand its message. 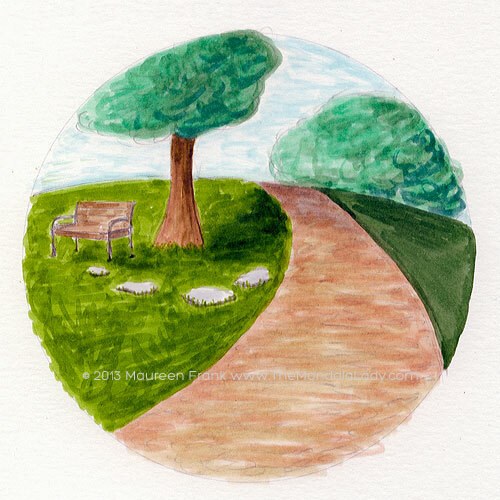 Now that I received it, that energy can move onto greener pastures (along the path and over the hill). As part of doing this mandala, I wanted to take some action in support of this message. 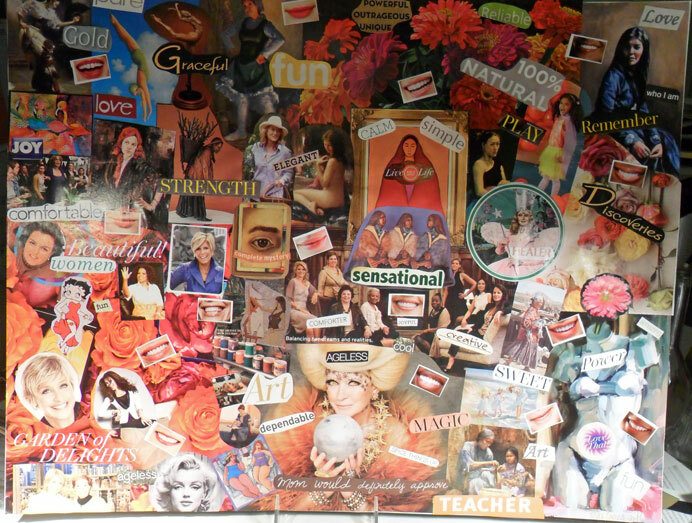 I had the idea to do a vision board on what it means to be a woman. Now I need to frame it and put it in a prominent place as a wonderful reminder … along with the mandala. 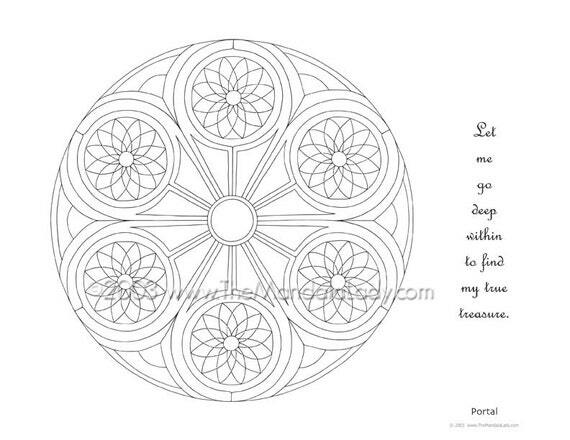 You can create intention mandalas for any issue or questions you may have. I recommend starting with something simple and working your way up to the more life-altering questions. Also these are meant to be done for and about you. Any questions or issues you have about someone else needs to be done from your perspective only. For example if you have an issue with a co-worker, do an intention mandala about what you can do to improve your relationship with that person rather than focusing on what the other person should do. Doing this type of mandala is meant to be one of many tools in your well-being toolbox, as a way to gather additional insight into your life right now. I highly recommend you work with your health care professionals for any mental/emotional/physical health concerns or issues you may have.